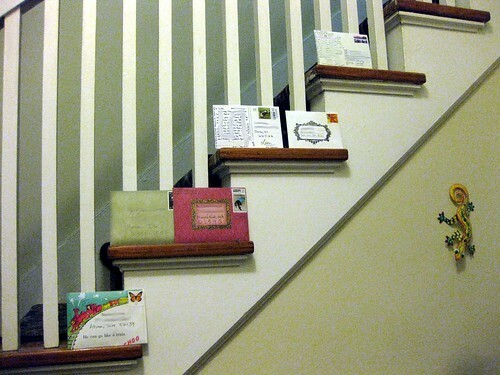 Ang of A Year of Letters recently asked where letter-writers put their outgoing mail when awaiting the letter carrier. I told her my method of lining them up along the stairs, between both the front and the back doors, and she asked for a picture. Okay, I finally got around to doing it! Currently there's nothing sitting there, though, because I've already mailed last night's fare. I didn't want to miss the last Saturday pickup today before the long weekend. Cute idea. This would be a perfect place to display some of your incoming "mail art." I'll bet you get some wonderful letters that are works of art. What a lovely method! Thanks a lot for sharing! I love this picture! What a great place to put them. It will be interesting to read where other peoples letters wait before they go on their journey. Mine sit beside my sewing box in my studio, before making their way downstairs, where they sit on the dresser before finally going out of the door. This is an absolutely wonderful blog site and I am so glad that I encountered it. You will be hearing from me A LOT in the future. I love it and I also adore the lizard on the wall so creative . I hope the new place has equally appealing outgoing staging.